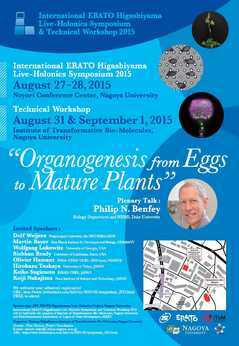 We are pleased to announce that we will have our second international symposium, International ERATO Higashiyama Live-Holonics Symposium and Technical Workshop 2015 “Organogenesis from Eggs to Mature Plants” in August 27, 28, 31 and September 1. Now we are open to register for Technical workshop, Travel grant, Poster presentation, and Registration for the symposium. Please enter this [Registration Form] site. It is possible to cancel a poster presentation before June 30. Please contact at hattori.yoko@f.mbox.nagoya-u.ac.jp. Please enter this [Registration Form] site.